Holiday decorating can go from fun to frustrating in no time flat. Here are some time and money saving holiday storage solutions. Cut cardboard a size that fits easily into a storage tub. Cut a slit at one end of cardboard and slide the end of the light cord in the slit. Now the lights can be wrapped around the board without getting tangled. The location where the lights are displayed can be written on the board so the next year decorating is simpler. Lights can also be wrapped around a clothes hanger. Secure one end of the light string to the tab that is normally lifted to secure pants and start wrapping around the hanger. 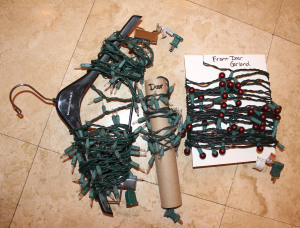 Wrapping lights around paper towel tubes or cylindrical cans will prevent tangling of lights and will result in less frustration the following year. Before taking down the decorations, take pictures of the different arrangements and their locations with your phone or camera so the next year it takes less time to display again. There is less likelihood that ornaments will get broken if containers with dividers are used. Ornament storage containers can be purchased or liquor boxes with dividers work well as long as the ornaments are wrapped in tissue or bubble wrap first. 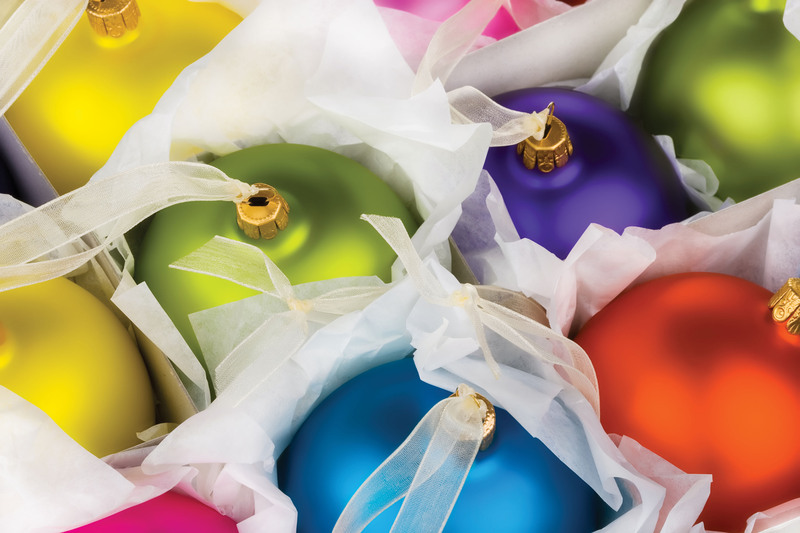 Small ornaments, extra bulbs and fuses and ornament hooks can be stored in egg cartons. Used wrapping paper can be run through a shredder which will produce a soft protective material in which to pack breakables. Used tissue paper can also be used as filler when packing decorations. Wreaths take up too much space in bins. Wreaths can be zip tied or tie wrapped to a hanger, and a dry cleaning bag or zippered garment bag may be used to cover the wreath. 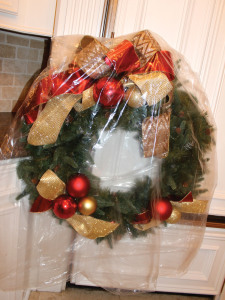 Now the wreath can be hung in attic or closet and will remain dust free. Storage bins should be labeled on the outside with duct tape or masking tape so decorations can be easily located and placed in the correct area. Separating and storing all mantle garlands from stairwell garlands will help when unpacking the following year. There will be less confusion in determining where each type of garland belongs. Using clear plastic bins with colored lids aids in visibility – seeing the decorations without opening the containers. Orange lids could designate Halloween décor and red lids Christmas. Write a note and place it in a bin if it is noted that more lights need to be purchased or that worn wreaths / ribbons need to be replaced. This will result in an organized list of the items you need for the next year. Bows can get easily mashed. If they are stored in a hanging position, it will take less time to fluff them the following year. Bows can be attached with clothes pins to wire hangers and then covered with dry cleaning bags. If bows are stored in a bin, stuff the loops with tissue paper to prevent crushing. Ribbon that has a wired edge makes the bows last longer from year to year because the wire helps retain the shape. These inexpensive time saving tips can help simplify decorating so that the “happy” can remain in Happy Holidays.